Contact Details : Contact The Authorised Officer, Phone No. 25541244, 25614414 & 9999173948. 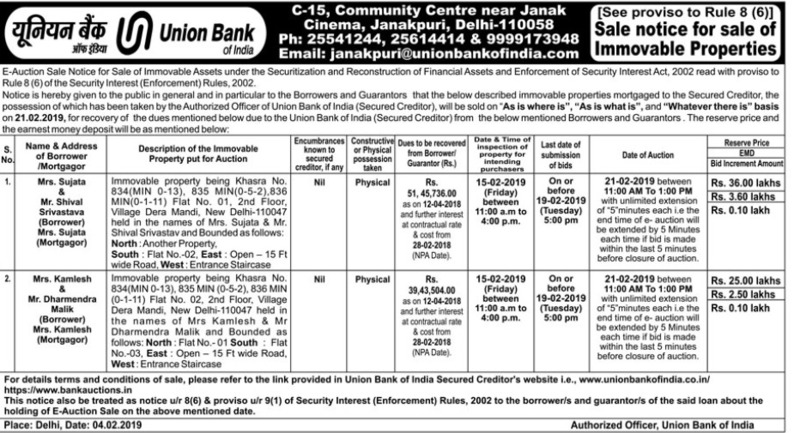 Schedule of Property : Immovable property being khasara No 834 (min 0-13)835 min(0-5-2)896 min (0-1-11)flat no 01 2nd floor village Dera Mandi New Delhi, Bounded as Follows, North : Another Property, South:flat no 02, East :Open -15 ft wide Road, West:Entrance Staircase. Inspection Details : For Inspection Details Please Contact The Authorised Officer, Phone No. 25541244, 25614414 & 9999173948, Date & Time Of Inspection Of The Property On 15.02.2019 From 11:00 AM To 04:00 PM.